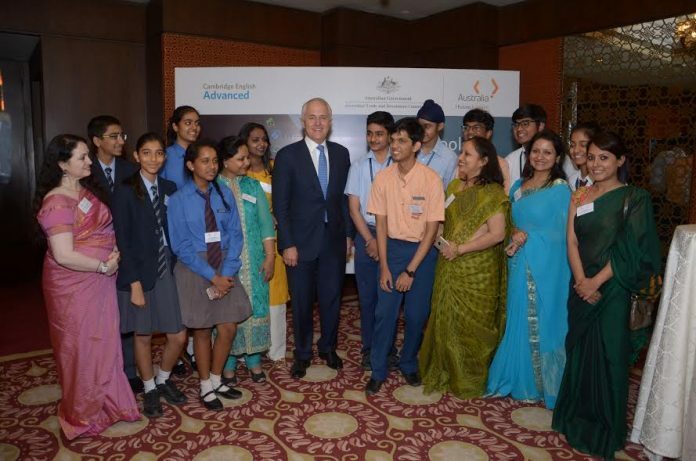 New Delhi: Australian Prime Minister, the Hon Malcolm Turnbull, MP and Senator the Hon Simon Birmingham, MP and Minister for Education and Training, Australian Government met with the winners of The Advance to Australia, “A2Oz” – India Schools Video Competition 2016-2017 in New Delhi yesterday. Students from New Delhi, Noida and Nashik schools won study trips to Australian Universities. Students from 325 schools across India participated in the competition and developed short films on next generation fields of study in areas of growing career opportunities in aerospace, construction management, earth sciences, nanotechnology and story-telling through dance. Students along with teachers from each of the winning schools will travel to Australia to participate in an all-expenses paid study programme to the sponsoring Universities between May to July 2017. More information about the winners of the India Schools Video Competition 2016-17 is available in the attached media release. Attaching the photographs of the winners with Australian Prime Minister and Australian Education Minister.